"Rich, Tasty, Powerful, Delicious" We have a large assortment of Middle Eastern sweets, breads, and appetizers. Freshly baked daily! Freshness starts here. Take a look at our delicious menu. Warning, may be sensitive to your taste buds! Anything fresh is always better, and here at Sultan Bakery we provide you with the best quality ingredients and no preservatives. "Make it now, eat it now" is our motto. 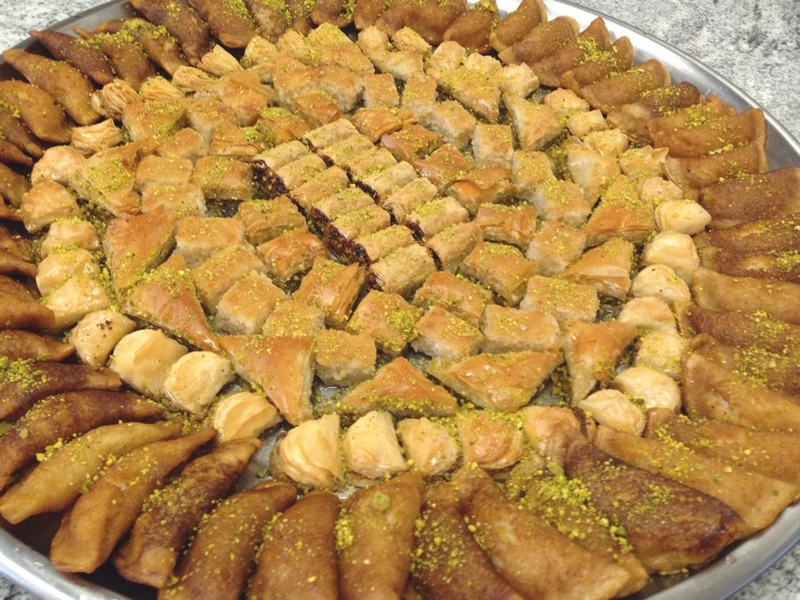 We are specializing in three main categories of food: Pita Bread, Sweets, and Appetizers. We make our pita bread just like it's made back home overseas, so you get the best, authentic taste. We put only the best quality ingredients and never use preservatives. This is not your ordinary pita. Desserts, from Baklava, to Ma'amoul to cookies, our desserts pack a powerful, rich flavor in these little bites. Making our sweets as authentic and traditional take care and effort. Your taste buds will thank you. When it comes to our appetizers, we have many tasty items to choose from including: Manakeesh (think of a mini pizza without the pizza sauce), falafel, baba ghanoush, hummus, dolmas and much more. If you have never tasted Za'atar you've never tasted middle eastern food. Mediterranean cuisine is the food from the lands around the Mediterranean Sea and its preparation. This geographical area broadly follows the distribution of the olive tree, which provides one of the most distinctive features of the region's cooking, olive oil. The region spans a wide variety of cultures with distinct cuisines, in particular (going anticlockwise around the region) the Maghrebi, Levantine, Ottoman (Turkish), Greek, Italian, Provençal (French), and Spanish. Middle-Eastern cuisine is the cuisine of the various countries and peoples of the Middle East. The cuisine of the region is diverse while having a degree of homogeneity. It includes Arab cuisine, Iranian\Persian cuisine, Israeli cuisine/Jewish cuisine, Assyrian cuisine, Armenian cuisine, Kurdish cuisine, Greek cuisine/Cypriot cuisine, and Turkish cuisine. Some commonly used ingredients include olives and olive oil, pitas, honey, sesame seeds, dates, sumac, chickpeas, mint, rice, and parsley. Some popular dishes include Kebabs, Dolma, Baklava, Falafel & Shawarma. Levantine cuisine is the traditional cuisine of the Levant, known in Arabic as the Bilad ash-Sham and Mashriq. This region shared many culinary traditions with Ottoman cuisine before and during the Turkish-Ottoman Empire, and it continues to carry an influentially mainstream character in a majority of the dishes today. It is found in the modern states of Iraq, Israel, Jordan, Lebanon, Palestine, Syria, and parts of southern Turkey near Adana, Gaziantep, and Antakya (the former Vilayet of Aleppo). In the broader family of Mediterranean cuisine, Cypriot cuisine also has strong Levantine influences. Perhaps the most distinctive aspect of Levantine cuisine is meze including tabbouleh, hummus and baba ghanoush.